The MC.30xx series offer a wide range of very fast 12 bit A/D converter boards for CompactPCI 6U bus. Due to the well-planned design these boards are available in several versions and different speed grades. That makes it possible for the user to find a individual solution. 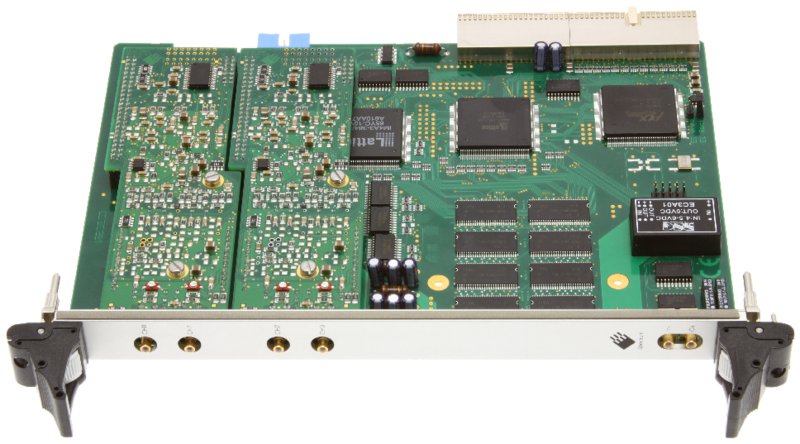 These boards offer one to four channels with a maximum sam-plerate of 200 MS/s. As an option 4 digital inputs per channel could be recorded synchronously. The installed memory of up to 256 MSample will be used for fast data recording. It can completely be used by the currently active channels. If using slower samplerates the memory is switched to a FIFO buffer and data will be transferred online to the PC memory or to hard disk. Several boards of the MC.xxxx series may be connected together by the internal standard synchronisation bus to work with the same time base.